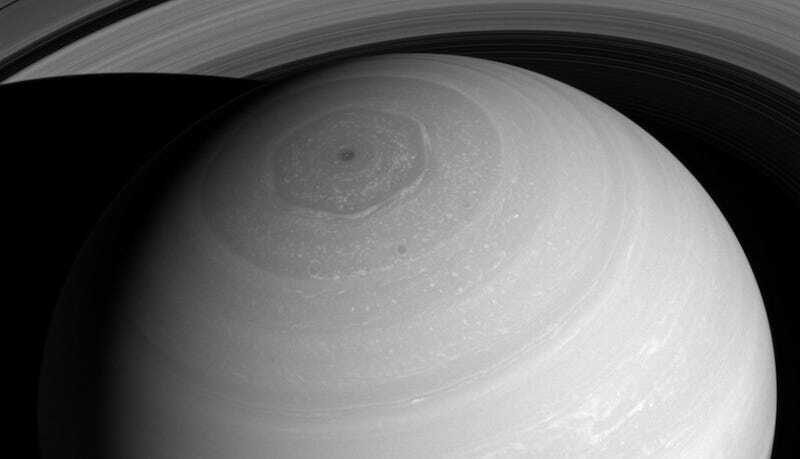 NASA’s Cassini spacecraft has given us some incredible images of Saturn, and its latest gift is no exception. Taken from above, the black-and-white photo makes the Ringed Planet look like a peaceful orb enclosed by its belted friends. In reality, the planet’s atmosphere is an ever-changing scene of high-speed winds and evolving weather patterns, punctuated by occasional large storms. The rings, consist of countless icy particles, which are continually colliding. Such collisions play a key role in the rings’ numerous waves and wakes, which are the manifestation of the subtle influence of Saturn’s moons and, indeed, the planet itself. Ah, Saturn. Just like us: Normal on the outside, but batshit crazy on the inside! According to NASA, the image was captured on July 16 and was taken from roughly one million miles away from the giant planet. Beginning on Nov. 30, 2016, Cassini will repeatedly climb high above Saturn’s north pole, then plunge to a point just outside the narrow F ring (the edge of the main rings), completing 20 such orbits. Then, on April 22, 2017, Cassini will leap over the rings to begin its final series of daring dives between the planet and the inner edge of the rings.